See you on the water? First boat to take places and deliver to John Barter. Following eligible boats to collect buoys and return to L'attitude or the sailing shed. If yachts fail to P/U it will fall to the next boat and so on, so if you are an eligible yacht, standby before leaving the course. Eligible yachts failing to P/U marks may not receive prizes. 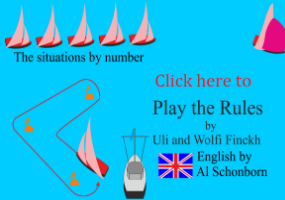 Ensure Racing Handbook is available to crew and onboard for Race Instructions. Please use Race Logger if possible - Ring 0418 253 479 for help with setting up. View "Organisation>Available Crew List" for crew wishing to sail and help place requests. Yachts not given their rights must signal with a red flag, in the racing area that she was involved in or saw, she shall hail ‘Protest’ and conspicuously display a red flag at the first reasonable opportunity to give the other boat an opportunity to exonerate their error with a 360 degree turn. Observe roster with the starting times and run tender before and after races. If engine is cold - please start engine and allow 30 seconds of idle to reach operating temp. Do not run tender at full speed when crossing turning basin of marina. Please pause at Neutral so to avoid a "crash" transmission shift. Skippers, drop and pick-up majority of crew at marina to assist tender operations. Race logger will start automatically and record your track with time markers. Our Objective: To run and administer yacht racing and to encourage cruising. Use [Contact Us] to request Passwords. The Real Goal: "The art of racing is not in winning. But in winning so the rest of the fleet are pleased you have won and the only way they can be pleased is for you to have shown not only better sailing than they, but also perfect sportsmanship." Uffa Fox.